When coming to a new platform or context, it’s always good to get a peek at some code and examples how to make things work. With Firefox OS and app development, it’s just the web with a few additions. Lately I’ve been fortunate enough to give and take part in a number of workshops around Firefox OS, to see developers trying to build things for it, port their existing web apps and much more. This has been a fantastic learning lesson for me, and it’s been crucial to see where people might need pointers, help or examples! This led to me creating the Firefox OS Boilerplate App. As the name implies, it’s there to provide you with the most basic features to get started with building an app from scratch, or tools to port your existing web app. The idea is also to avoid any dependency on external libraries or resources, but rather be self-contained. The easiest way to get started, installing it and testing the various features, is to navigate to the Firefox OS Boilerplate App in the web browser on a Firefox OS device or in the Firefox OS Simulator. Once you’re ready to get started developing, download the code and run it on a web server, or point out your local version of the Firefox OS Boilerplate App in the Firefox OS Simulator. Note: make sure that the paths in the manifest file are valid on your localhost – bear in mind that these paths are relative to the root of the web site they are being served at. Also make sure to configure your server to send the manifest file with the right Content-type: application/x-web-app-manifest+json. I’ve provided an .appcache file for enabling offline support (it’s disabled by default). When you develop web apps, by default they are being delivered from a server, thus needing online connectivity or offline support to be enabled, to work as expected. You do have another option, though, which is packaged apps. Basically, what this is, is putting all the files of your app into a ZIP file, making them available directly on the device itself. Packaged apps can also request an elevated access to certain WebAPIs in Firefox OS that aren’t available to hosted apps (we’ll go more into the differences in a later post here on Mozilla Hacks). There are a couple of files included in the Firefox Boilerplate OS App to help you get started, if you are interested in this. The Firefox OS Boilerplate App is a work in progress, meaning that it’s likely to change over time. I believe, however, that it gives you a good head start and look into what’s possible with web apps in Firefox OS. Hope you like it, and please let me know what you think! please incluse some tests along , so we can learn how to write tests for a firefox os app, and why not including a mocking framework for firefox os api too ? I believe that’s out of the scope for the Boilerplate. It’s all good things, but then I believe it would grow and become too big, and not being an as easy and bare-bones approach as it is today. I believe Mortar would be a better fit for that, and they that these options can complement each other. On the topic of tests, best place is probably to look at the tests in Gaia (the UI for Firefox OS). Ah, nice – thanks for the tip! How do you build gaia’s ui block ( http://buildingfirefoxos.com/ ) in this boilerplate ? Is there any stylesheet to import ? Right now, you need to copy the files and code from those building blocks into your own app to make it work (i.e. your app won’t have access rights to the files in Gaia). We will also have a future blog post here on Mozilla Hacks about the Gaia Building Blocks – stay tuned! This is great! 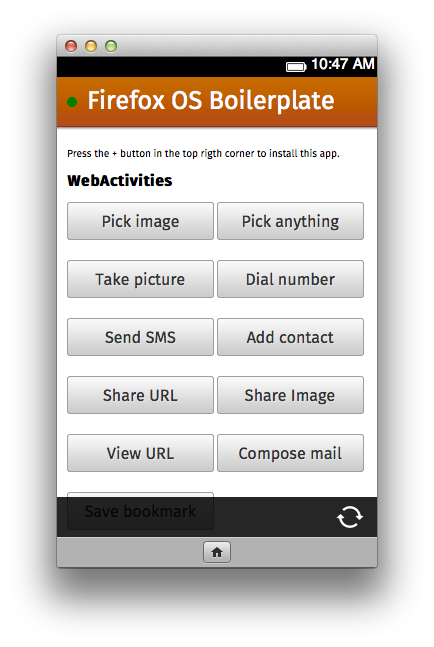 Just yesterday I ported my first webapp and tested it in the Firefox OS Simulator. I’ll add offline support now that I’ve read about it. It’s a great starting point for new developers, thanks! BTW, FirefoxOS is the most exciting technology of all time. Will you guys support custom launchers for the homescreen? I ask because personally I’m not fond of the iOS-style metaphor of the homescreen as the app manager. If possible, I’d like to write something more akin to the custom Android launcher “Action Launcher” where I could just put quick access app links on the homescreen, and have a slideout alphabetical list of all apps for those I use less frequently. When it comes to launchers, I don’t really know at this time. I definitely agree with you and think it would be a great alternative. Right now you can hack Gaia (the Firefox OS UI) yourself and push updates to the phone, but I don’t believe you would have access enough as an app, through APIs and more, to change the actual home screen. Is there a website for automatically creating the icons? For example, if I have a 199×199 jpg, can it spit out a rounded pngs at 60×60. There’s a great resource with instructions, downloadable examples etc in the Firefox OS app icons style guide. What I meant was a web service that can help un-photoshop people like me to generate the right sized icons from any image. If there isn’t such a web service; I’d happily write one. Ah, I see. Well, if it’s only resizing existing images, I’m sure there are options out there. Personally, though, I think that would probably lead to non-optimal icon design (since it’s not just about size). I’d rather recommend taking any of the templates from the icon style guide and use online editing services like Pixlr or online Photoshop and then adapt them to what you want it to look like. This is really help me to get understand the workflows. Can’t find “Developer mode” in “Settings > Device Information > More Information > Developer” on Simulator, desktop B2G or Unagi phone. Is there any other step which enables that setting? zalun — I believe this is now called “Remote Debugging”? That’s how I was able to get packaged app installs working. If your packaged app is of type “privileged” there currently isn’t a way to install this on an actual device, as far as I know. If you run `adb logcat` you’ll see a hint at the error, and it’ll likely be something like invalid package, which means the signing is invalid (b/c it’s not signed). I know that I’ve tested the Boilerplate with installPackage and installing the ZIP file, but I need to look more into the actual functionality of it. ff addon on github. I use it all the time to test my privileged packaged app on unagi ! Yes, that works for pushing apps to the device, but it doesn’t enable installPackage from within a web page in the web browser. I just checked in the Simulator I have, version 1.1pre3, and it’s in there. One correction: the mini manifest for packaged app should be served the same as a webapp manifest, not a cache manifest. Most notably, its mime type is application/x-web-app-manifest+json. So it’s sufficient to name it with a .webapp extension, as you added the Apache configuration already. As a rule of thumb, never name a file with a .manifest extension, this is so much overloaded. That’s very interesting on the mini manifest! The documentation on Packaged apps says it should be named package.manifest (and as such, I’d like to serve it with the Content-type that goes with that, to not override other manifest files etc). I agree on overusage of .manifest files, but went by the docs (and it worked :-)). I’d be happy to swap it out for package.webapp. Can you spread some more light on this? – the name of the file has no importance. However, we use to call it update.webapp (because we call it “update manifest” also, as it is used to install and update packaged apps). – the Content-Type is clearly application/x-web-app-manifest+json :) However we don’t check this if the origin of the installation website is the same than the origin of the application, and this happens most of the time. Maybe that’s the explanation of why that worked. I’ll modify the MDN on this when I have the chance, thanks for pointing it ! BTW, I made https://github.com/julienw/self-updating-packaged-app which can be used to show how a packaged app can update itself too (that works for hosted+appcache app too). Thanks, much clearer! I’ve also updated the Boilerplate repository and the blog post. if I am not wrong, there is no need to name the mini-manifest with an specific name. It just need to be served with the correct Content-type, which, as Julien already mentioned, is “application/x-web-app-manifest+json”. Yep, I was totally clear on the one in the ZIP file. But not the mini manifest. Thanks for clarifying, that means we can use the .webapp extension for the mini manifest – great news! I’ll update the Boilerplate App and post accordingly.